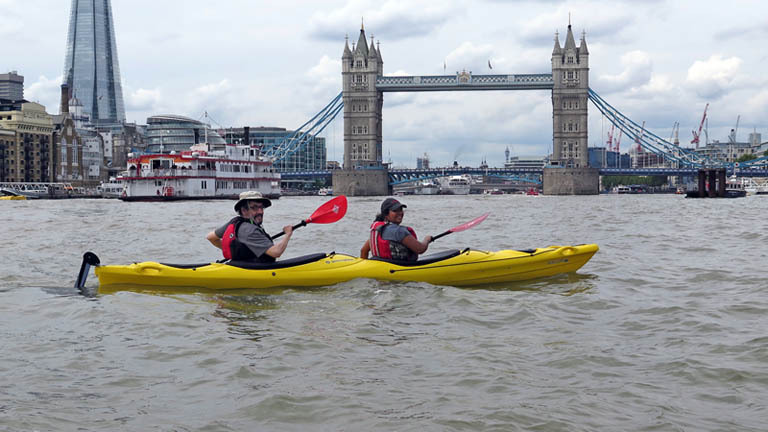 The London Kayak Company is a new kayaking company providing guided trips on the River Thames. Based in Greenwich, the company offers opportunities to explore London from a unique and exciting perspective. No previous kayaking experience is required. The London Kayak Company is headed up by Harry Whelan, a highly experienced sea kayaker who has paddled around Britain and has twice circumnavigated Ireland. Harry holds the 25 day speed record for kayaking around Ireland, along with trip companion Jeff Allen. There isn’t much Harry doesn’t know about the tidal Thames, he has been working and kayaking on the river for 18 years now. Like other kayaking companies on the tidal section, the London Kayak Company is a British Canoeing Approved Paddle Sports Provider and is compliant with the Port of London Authority, who control all traffic on the river. The company uses stable double kayaks with rudders, making control simple, and all other kit is provided. You just need to dress warmly for the day and London Kayak Company’s experienced guides will keep you safe on the water, giving you an exciting and memorable day out. Trips include Greenwich to Tower Bridge and back; an exploration of Greenwich including a paddle up the Ravensbourne (a tributary of the River Thames); seal watching from Ramsgate (a non-London trip) and the challenging, but rewarding Kayak Bus, a three hour, one way trip that goes all the way from their base in Greenwich to west London. All of their trips are for adults only.